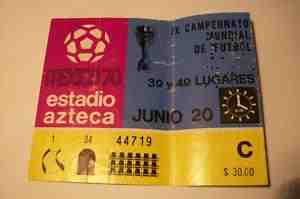 The 1970 World Cup was also held in Mexico. 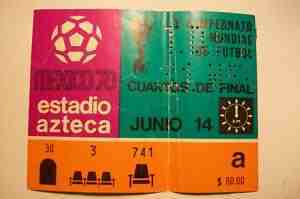 Design principles that were adopted for the 68 Olympics were applied to the World Cup. 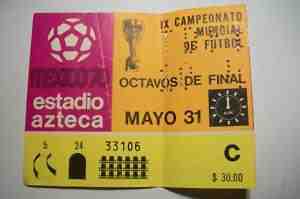 Not only was the same typography used, but a similar system was applied to seat finding on the tickets. Wyman could have designed something totally new, but he knew that the existing system worked, and using it again would not make the design any less of a success. By tweaking his designs he created a system of symbols that were recognizable, worked well and were as easy as ever to use. Wyman’s symbol project for the Mexican metro is the first example of pictograms in such a daily public facility as the subway. Yukio Ota explains in his book on Pictogram Design it was very significant that they were not designed by law as in the case of road signs. They were not restricted to a given period such as a world exposition and were provided for use by everyone. Unlike the Olympic designs, these symbols were going to be in use for a significant period of time. Wyman wrote that the signs he designed were effective even in the case of illiterate people or foreign tourists. The main reason that the system was so effective was that pictograms were used to represent each station. Like his previous designs, Wyman used Mexican history and culture to inspire and inform his designs. In this example, it was crucial that the pictograms accurately depicted the connection with the individual stations. Wyman took advantage of the culture and used reference points to represent stations and their neighboring area. These pictograms demonstrate how surroundings and context can greatly affect the design and meanings of the symbols. Wyman suggests that if you can describe a pictogram it will work. All off the station symbols do this and these descriptions link to the station and its immediate environment. The duck itself cannot single handedly represent the station, but in the right context it communicates clearly and efficiently. The way in which Wyman used the history, culture and surroundings to create the pictograms has not only given the signs a lease of life, but has greatly aided communication. Wyman’s work for Mexico did exactly that. The pictograms he designed throughout the 1960’s and 70’s not only created great international communication devices, but told a story about Mexico. Using pictures alone, a piece of history was depicted and element of Mexican culture was revealed. 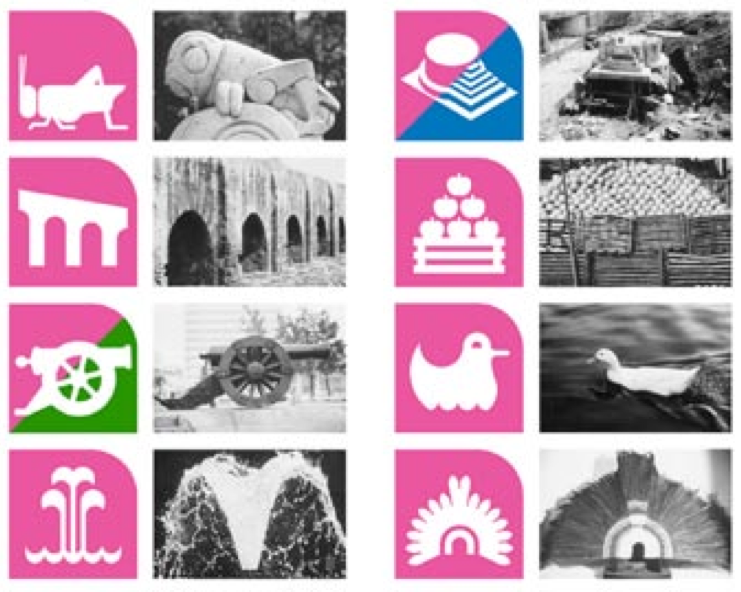 The pictograms not only represented the object/facility, but embodied what Mexico was about. Wyman’s pictograms ultimately showed that pictograms can have personality or display cultural characteristics and communicate across language barriers. Coming soon…the conclusion to the Pictograms, International Communication and Cultural Diversity series! This entry was posted in Olympics, Pictograms. Bookmark the permalink.